Uttar Pradesh-U.P Rural Institute of Medical Sciences & Research Saifai ,Etwah is a premier autonomous institute established by Government of Uttar Pradesh under Act 2005. 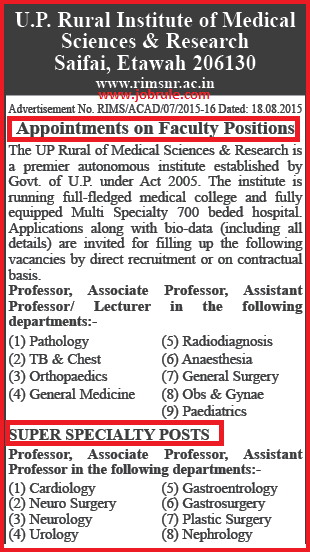 RIMSNR Etawah invites application from interested and eligible candidates for recruitment to the post of Faculty positions Professor, Associate Professor ,Assistant Professor/ Lecturer in the departments of Pathology, TB & Chest, Orthopaedics, General Medicine, Radio diagnosis, Anaesthesia, General Surgery, Obs & Gynae, Paediatrics, “Super Speciality Posts’ like Cardiology, Neuro Surgery, Neurology, Urology, Gastrosurgery, Plastic Surgery, Nephrology by direct recruitment or Contractual basis. 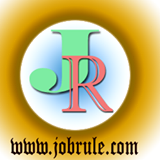 To read more details about RIMSNR Etawah faculty Jobs 2015, simply go through below given official advertisement link .